They like fruit and bread. After long working day I like to go to the park to walk around, get some fresh air or go for a run. Another thing I like to do in the park is feeding the turtles. It is such a luxury for me. There is a big pond in the middle of the park which is my favorite spot, it can definitely refresh my day. They contains, I think, almost a hundred turtles. They are not shy or scared of human at all. You just go to sit or stand by the pool, and ten of turtles will swim to your direction waiting to be fed. This is definitely a good therapy for me. Feeding turtles somehow free myself from intrusive thoughts. 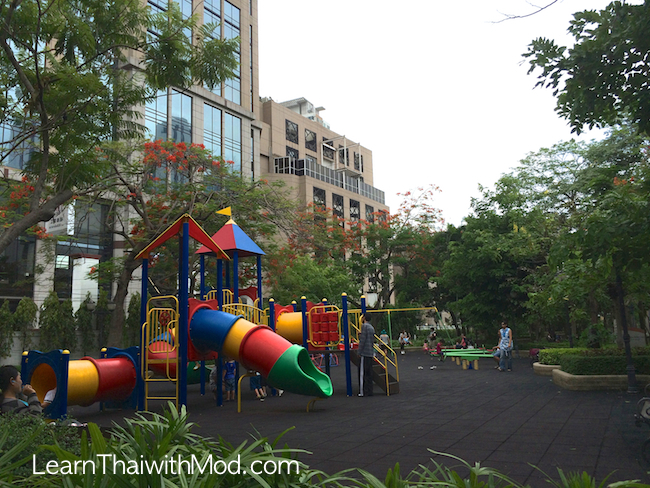 This park is a small gem in the middle of bustling Sukhumvit area. 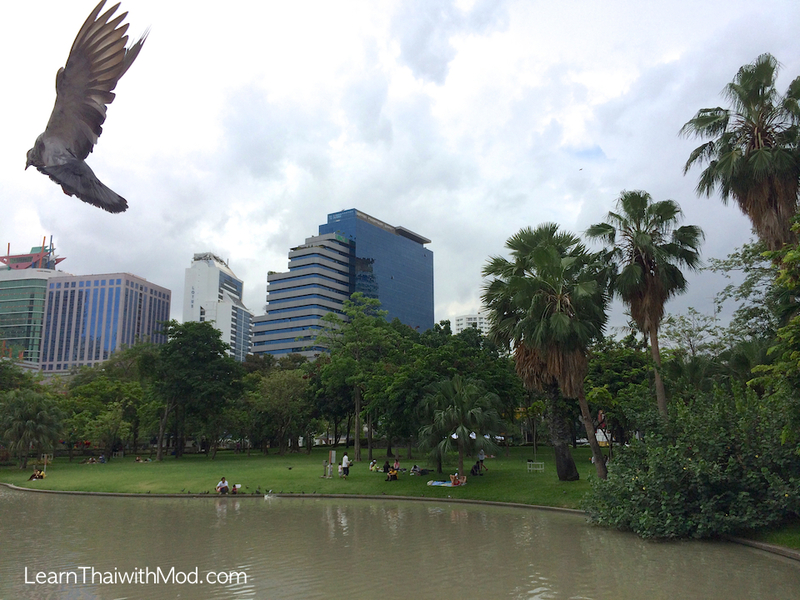 It is called Benjasiri Park. (สวนเบญจสิริ). The park is easily access by BTS (Phrompong Station). 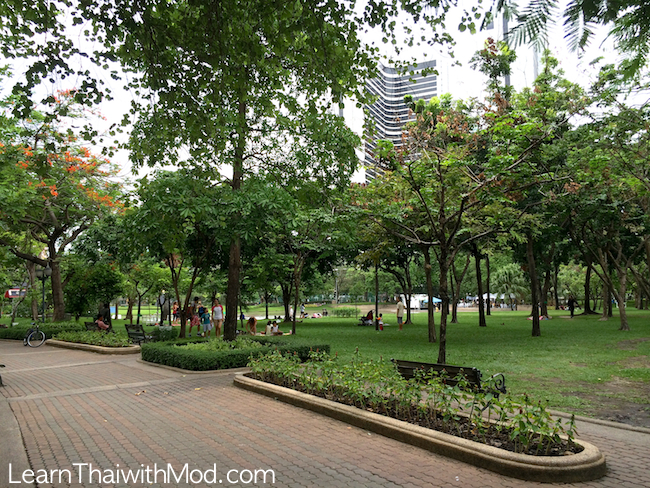 Its location next to Emporium mall, between soi Sukhumvit 22 and 24. and opposite to Villa Market gives an option for park-goers to buy snacks and drinks there and enjoy picnic in the park. Benjasiri Park also offers outdoor sports facilities rarely found at other public parks, including a basketball court, roller skating/skateboarding rink, tennis court, outdoor swimming pool and a multi-purpose court for volleyball and Sepak takraw. Kids play area is safe and well maintained. also i want to know what your price is …. I just moved to Pattaya from America and find your videos easy to understand how Thai Language is used. Keep up the good work and do you provide any class lessons? I’ve been in BKK for a year and my Thai is basic but I can get by in everyday situations. Thanks for your lessons, they are very helpful! I’m coming to BKK next month and for the second time with my baby: so happy you spoke about this park! We’re based on Sukhumvit soi 11 and it’s quite near! I am glad my blog posts are useful:) Enjoy your stay in Bangkok! I’ve watched all of your videos (some more than once) and I think is time to comment. I had no interest in learning Thai, because I was learning Mandarin. Both being tonal languages, and me being tone deaf, I looked everywhere for clues that could help me make progress with tones. And your tone explanation videos helped me figure out what’s going on with Mandarin tones (Thai and Mandarin have different tones of course, but the logic behind them is similar). Also, your other videos are helpful because of your crystal clear and just-the-right-speed Thai pronunciation and on-screen tone marks. 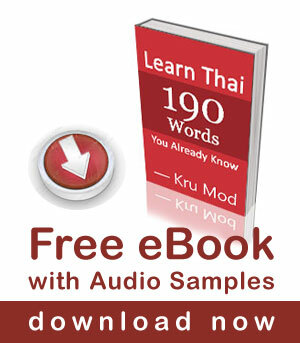 No need to say that I changed my mind about “no interest in learning Thai” attitude, and now I really wanna learn it! I already made some amazing breakthroughs … for example I don’t think any more that “Kru” is your surname. (1)	At the and of your video lessons you could repeat (once again) all those Thai words, phrases and sentences that you used in the video, one after another. Of course, keep doing on screen Thai writings and tone marks for that part, because it is of great help to novice learners. You could read it twice, once at a slow speed, and than at a normal speed. (2)	Try to convince your brother to participate and pronounce everything that you are pronouncing. That way male speakers can get better hang on pronunciation and tones. If he doesn’t want to do it, give him another massage. The first recommendation came to me when I was watching your “wishing you goodnight” video (love Kina’s song!). I tried to mimic, as best I could, everything that you very saying—from tones to pronunciation. And it really helped that Thai words were flowing one after another, that there were no English parts that I had to skip, and that everything you were saying was written on the screen. The second recommendation became obvious after I’ve seen “tongue twister” video that you did with your brother. It was nice to hear male and female speakers saying same things at the same time at different speeds.